We apologize for the inconvenience but our manufacture has discontinued their line of Mortars & Pestles. We are actively looking for a new supplier. Scroll down to see our selection of mortars and pestles for sale. Mortars and pestles are used by care givers and individuals to crush medication for oral consumption. We carry a variety of mortars and pestles for sale including various sized mortar and pestle sets, glass mortars and pestles and porcelain mortars and pestles. What is a mortar and pestle? Mortars and pestles are tools used to crush, grind, and mix solid substances into a powder. The pestle is a heavy bat-shaped object, the end of which is used for crushing and grinding. The mortar is a bowl, typically made of hard wood, ceramic or stone. The medication to be ground is placed in the mortar and ground, crushed or mixed with the pestle. 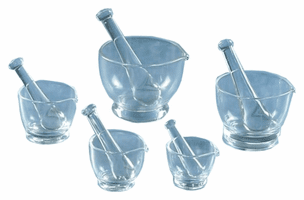 Mortar and pestle sets can also be used in the kitchen grind herbs, garlic and other ingredients by hand.